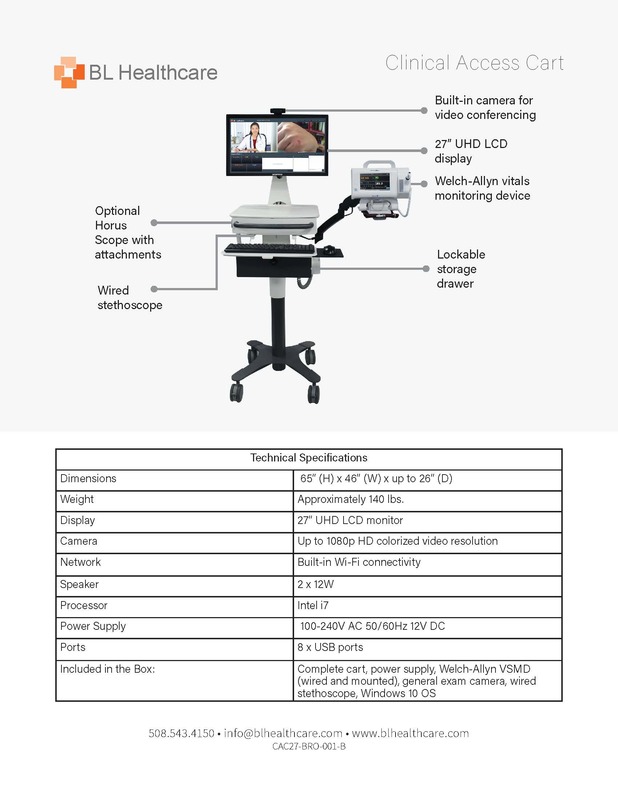 The Clinical Access Cart is a state-of-the-art clinical care platform supported by a dedicated computer system and a next-generation Welch-Allyn vitals assessment device. A paradigm of clinical excellence, the Clinical Access Cart is the perfect telehealth solution bringing telemedicine services to hospitals and acute-care environments. With all of the device’s programming coming pre-installed and its capabilities built-in to the platform, simply plug it in and start improving the quality of care within your facility! Including pulse rate, blood pressure, blood oxygen saturation, body weight, body temperature, and more! Bring quality healthcare to under-served communities and help enhance the impact of your medical outreach programs. Our cart can easily be wheeled from place-to-place and all of the equipment is contained within the device for maximum portability. Treating in place has been proven to improve patient outcomes and enhance quality measures.